Good Morning Everyone! Today's Tuesday Tool is one of my new favorites in my paper crafting tool chest. It is the Stampin' Up Essentials Paper-Piercing Pack. Now getting pierced accents on all of my projects has become very easy. 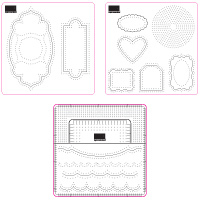 You get three different templates which also coordinate with the Stampin' Up Punches and Edgelit and Framelit dies. Use them to design with or customize your patterns with the grid.